debriefing, instructor and server rooms. 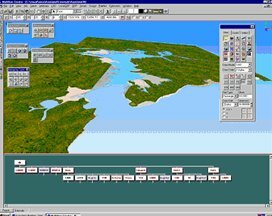 MTE Centre presently has ready to use 10 databases of sea - harbour areas including 8 European ones: Gibraltar Strait, English Channel, Europort, Hamburg, Danish Straits (Great Belt, Little Belt), Ystad, Świnoujście and 11 ship models including LNG carriers. MTE Centre also participates in “Officer in Charge of a Navigational Watch” (operational level) and “Master and Chief Mate” (management level) courses, performs shiphandling courses of large ships, ships of unusual characteristics, twin screw vessels and tugs. Contact: +48914809716, +48914809717. 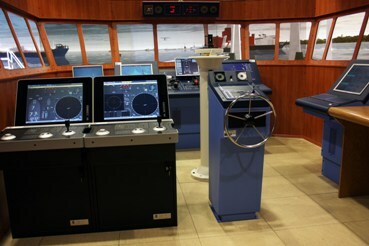 In scientific domain MTE Centre is ready to perform navigation safety analysis of any water region based on tenths of registered parameters of own and target ships’ in reference to the research area (among others: positions, SOG, COG, SOW, COW, heading, rate of turn, ship’s controls adjustments - propulsion devices, rudders, thrusters, tugs, anchors, mooring ropes, external excitations).